The filler needs to cure only a few days before it is hard enough for me to continue working. 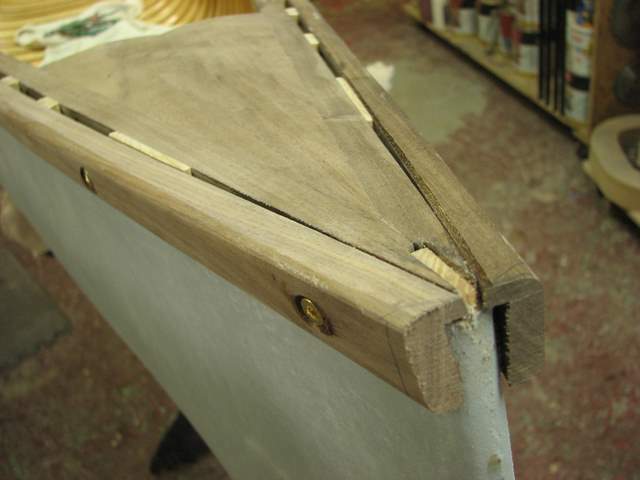 The first step to do is to give a quick sanding to the filler along the gunnel line before trimming the excess canvas down. Its a lot easier to do this now before the gunnels go on. The gunnels are made from stock 1" tall by 3/4" wide. 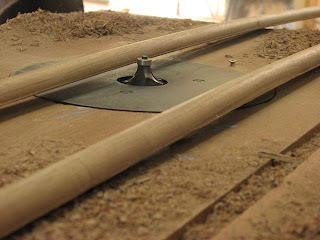 This allows for a 3/16" rabbet along the backside and for a 1/2" radius round-over router bit to shape the outer corners. The ends of the gunnels are tapered for about 18"-24", depending upon the particular canoe. 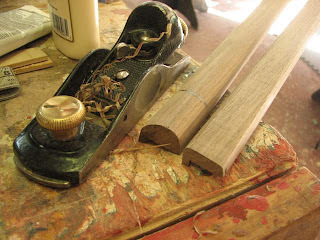 It doesn't really matter how long the taper is as long as all four of the ends are shaped the same. For me, this also allows the 1/2" radius to reduce to a 1/4" radius, a detail which will be important later on. Stay tuned! There's an old saying that "You can never have too many clamps!" It's true, and its taken me a long time to have almost enough clamps. I don't need this many just to clamp the gunnels in place but I do need them closely spaced in order to hold the gunnel snug while I get the screws set exactly where I want them..
What is not seen is that I establish the screw spacing and mark each rib/screw position with a pencil mark. 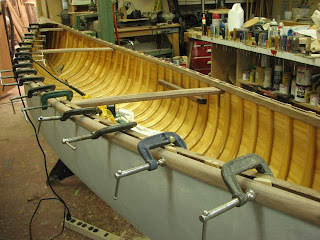 I usually put the screws on every other rib, some canoes are every rib, and often you will see them on every third rib. What matters more is that you don't mess up your pattern! That just looks sloppy. 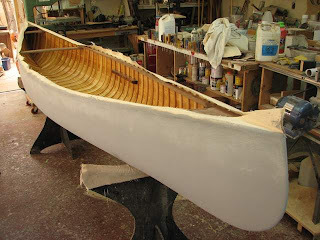 Here you can see how the tapered rib ends allow the gunnels to fit flush at the stem. The gunnel ends are cut with a little extra room for refining the fit. Posted by Doug Ingram at 8:31 a.m.